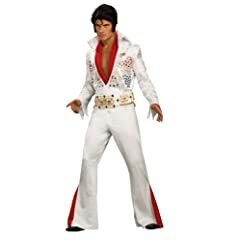 This page helps you select a great Elvis Presley Jumpsuit. Yes they are outlandish with their glitter, fancy belts and vibrant color. 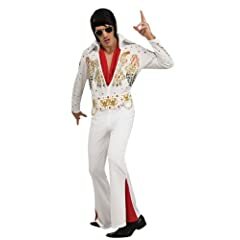 Available not only for male Elvis fans, buts women, kids, toddlers and even your dog so you can attend the next Elvis music festival as a family or a costume party. 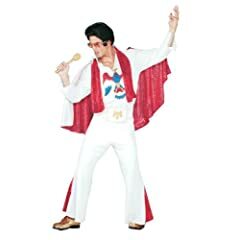 Every Elvis fan will feel like the King himself when wearing these great costumes. 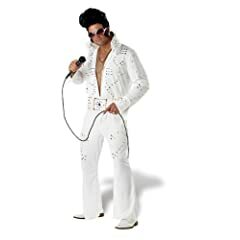 Wear any of these Men’s Elvis Jumpsuit costumes and be the King! 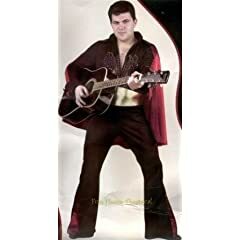 There are a variety of styles for this legendary singer including the Hawaiian Aloha, Rock, Rhinestone Eagle and a few with capes so you actually feel like Elvis. Some feature gold studs, a satin lined sequin scarf, detachable cape with sequin lining, belt with gold glitter eagle crest and more.